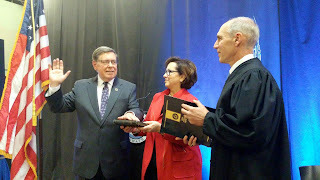 State Senator James L. Seward (R/C/I – Oneonta) took the oath of office today for his 16th senate term at the Foothills Performing Arts Center in Oneonta. “New York State has so much going for it and I am reenergized as I begin my 16th term in the state senate. “This past year featured a number of legislative victories - We have had a number of significant wins over the last few years - lower taxes for our middle class families, record state aid for our schools, support for our upstate roads and bridges, and additional laws to address the crushing heroin and opioid epidemic. Senator Seward was first elected to the state senate in 1986; he will be serving his 16th term.